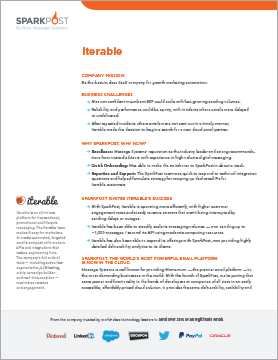 Iterable is an all-in-one platform for transactional, promotional, and lifecycle messaging. Their mission is to be the best-in-class for growth marketing automation. Using SparkPost, Iterable’s Growth Marketing Platform can offer new functionality in its platform, operates more efficiently, and expands engagement rates.